Bouchard Cooperages is a global barrel brokerage company representing a portfolio of highly skilled manufacturers of premium French, Eastern European, Hungarian and American oak barrels and French oak alternatives. This fine collection of Coopers includes Tonnelleries BILLON, DAMY, MAURY, MASTER COOPERS, EUROPEAN COOPERS HUNGARY and the oak alternatives supplied: CANADELL. Non oak related, Bouchard Cooperages also imports Italian eggs made of cocciopesto and concrete from DRUNK TURTLE, amphorae made from Impruneta terracotta from MONTECCHIO and sandstone or "grés" jars from VIN ET TERRE. The companies we represent employ many talented individuals committed to producing outstanding products, always maintaining a high level of performance. From tree selection in the forest to the finished barrel ready for wine, quality control is foremost at every stage of production. 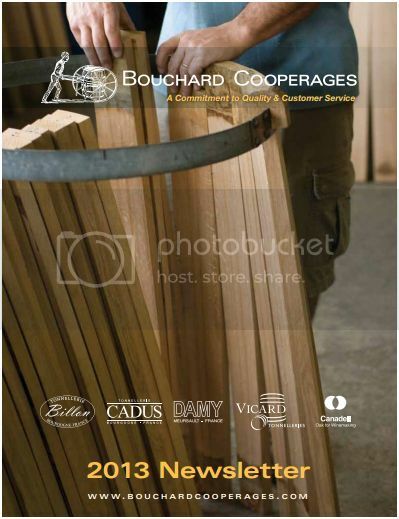 Successfully merging rich history with an ever-changing and exciting future, the five cooperages and a French oak alternatives producer represented by Bouchard Cooperages adhere to the following: they value their unique traditions, respond to market demands, and embrace developments in the industry - continually improving production in an on-going effort to keep costs low and quality high. All of our Coopers are also all family-owned enterprises, mindful of their history and commitment to future generations. Vincent Bouchard founded Bouchard Cooperages in 1979 on one basic principle: to give Winemakers access to the finest custom-fabricated French oak barrels - in time for harvest and at minimal expense - year after year. Since then, there have been a lot of changes in the barrel business, and Bouchard Cooperages has been at the forefront of much of the innovation (studies on toast levels, forest origin, and the geography of stave aging, as well as the introduction of the silicone bung and the shrink-wrapping of barrels). In 2009, we began experimenting on the true effect of atmospheric conditions on stave aging. Our goal is to determine precisely when staves are ready for barrel fabrication, depending on specific geographic and climatic factors (a 3-year aged stave may not be ready if there was a drought for 2 of those 3 years). Last year we also introduced the "electronic signature," effectively allowing our Winemakers to approve orders from their laptops or smart phones. And this year, all of our Coopers began emailing their invoices in an effort to not only save paper, but to save our Customers time and money with accounts payable processing. Through all of these changes, our core principle remains the same. We pride ourselves in developing long-term relationships with both our Winemakers and our Coopers. We believe it is only through this on-going collaboration that we can help Winemakers to consistently realize their winemaking passion. Simply said, we are forever committed to helping our Coopers craft a better barrel, and to helping our Winemakers craft a better wine. Our team of Sales Consultants pride themselves on meeting with Winemakers, tasting through their wines, and helping them find the best match for a particular varietal, terroir, and individual winemaking style. With over 30 years of experience and a global presence, we are also experts in logistics – from container consolidation to exchange rate fluctuation risk management - firmly committed to unparalleled customer service. Each company we represent has a unique history and story to tell. For more information on their products and statistics, please select from the list below. Tonnellerie Billon was created in 1947 by Gaston Billon, is located in Beaune and produces premium traditional forest origin barriques and casks sourced from 10 different French forests. Tonnellerie Billon is managed by Vincent Damy, who oversees 22 coopers and an annual production of 12,000 barrels. Vincent Damy was awarded the prestigious “Meilleur Ouvrier de France” in 2007. Tonnellerie Billon along with sister company Tonnellerie Damy form Les Tonnelleries de Bourgogne or The Cooperages of Burgundy, one of the few suppliers still able to offer oak selection by forest origin. Since 1997 Barrels produced at Billon are CTB certified (fûts de traditions Française - traditional French barrels) which is a unique label ensuring a high quality barrel’s traceability, drying, technical features and respect for tradition. Billon is part of the PEFC (Programme for the Endorsement of Forest Certification) which is the world’s largest forest certification system that promotes sustainable forest management. Billon barrels are most well known for respecting the wine and being true to the varietal by showcasing the fruit on the nose and palate as well as offering tremendous length and enhanced minerality. Tonnellerie Damy is a third generation cooperage located in Meursault, Burgundy that was founded in 1946 by M. Roger Damy and produces premium traditional forest origin barriques and casks sourced from 10 different French forests. Tonnellerie Damy is now managed by Jérôme Damy who oversees a team of 35 skilled coopers who produce roughly 20,000 barrels a year. In 1976 Jacques Damy was awarded the Meilleur Ouvrier de France award and in 2007 Jérôme Damy was awarded it as well by the President of France. Tonnellerie Damy along with sister company Tonnellerie Billon form Les Tonnelleries de Bourgogne or The Cooperages of Burgundy, one of the few suppliers still able to offer oak selection by forest origin. Since 1997 Barrels produced at Damy are CTB certified (fûts de traditions Française - traditional French barrels) which is a unique label ensuring a high quality barrel’s traceability, drying, technical features and respect for tradition. Tonnellerie Damy is part of the PEFC (Programme for the Endorsement of Forest Certification) which is the world’s largest forest certification system that promotes sustainable forest management. Damy barrels have a stunning ability to soften tannins and provide a creamy, rounded mid-palate, whilst supporting and enhancing fruit sweetness to complement both white and red wines with a variety of forest origins. Tonnellerie Damy is one of the most renowned Burgundian Cooperages—the barrels are synonymous with the world’s greatest Chardonnays and Pinots and are featured in more than 80% of Domaines in the Côtes de Beaune/Nuit. The distinctive and delectable house style is the reason you will find Damy barrels in many wineries around the world. French oak supplier for oak alternatives, fans, chips, dominos and barrel inserts. Merrandier Canadell was established in 1940 by Lauriano Canadell in Trie-sur-Baîse in France’s Hautes Pyrénées department. For four generations and over sixty years, Canadell has been providing staves of the highest quality to the largest and most prestigious cooperages around the world for barrel making. In 2000 Canadell launched their own line of fine oak alternative products for winemaking. Canadell is currently managed by Jacques Canadell and his son Frédéric. Canadell is one of the oldest and largest customers of France’s Office National des Forêts (ONF). and show characters remarkably similar to barrel aging. Therefore, bridging the gap between barrels and oak alternatives. Canadell oversees the entire manufacturing processof its’ oak alternative products for full traceability, from selecting trees in the forest to seasoning, splitting, air drying, toasting and the final packaging of the final product. European Coopers is a premium Hungarian cooperage that produces 100% Hungarian oak barrels. The cooperage is located two hours South of Budapest and is proud of remaining independent since its establishment in 1997. With over forty years of experience, Master Cooper Kristof Floding has been at the heart of European Coopers since day one in 1997 and overseas a team of 15 Coopers that produce 5,000 barrels a year. European Coopers was co-founded by three respected Italian winemaking families that were searching for premium hungarian oak for their wines. It is now co-owned between these families and Vincent Bouchard. After opening its markets and becoming part of the EU in 2004, there has been a resurgence in demand for Hungarian oak on the international wine scene. European Coopers produces premium Hungarian oak barrels that are everything you would expect from a quality driven artisan Cooper. We have been using European Coopers barrels for many years. The barrels have guaranteed a nice elegance and finesse in the wines. Some of our best wines are aged in European Coopers barrels. Kristof and his team control the entire process in house, from sourcing and selecting 100% Hungarian logs from Hungary’s best forests in the Zemplen and Mecsek hills, seasoning the staves, to producing and finishing the barrels. Cooperage for French and American oak barrels. (225L-228L). After 36 years of passion and dedication to the cooperage business, Vincent Bouchard finally put his signature on a barrel under his Master Coopers brand. The Master Cooper brand strives for the integration of wood and wine throughout the 5 stages of tasting: the nose, the front palete, the mid palate, the finish and what in Italy is called the “retro-gusto” where the wine comes back after drinking or spitting. The integration is balanced in a way that shows a reverence for fruit and terroir. What distinguishes the Master Coopers brand is the unique proprietary way the barrels are toasted. What I wanted to achieve with the Master Coopers recipe is a complete integration of wood and wine throughout the 5 stages of tasting. 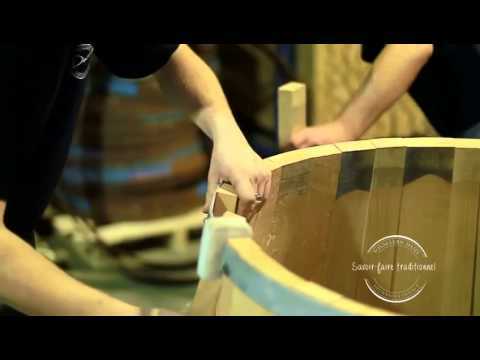 MASTER COOPERS MADE IN AMERICA: Vincent Bouchard partnered with one of North America’s premier Cooperages to cooper American Oak barrels, made in America. The proprietary toasting process is much longer than the traditional toasting time and done at a lower flame, designed to optimize the essence of American oak while minimizing it’s undesirable characteristics. That means more subtle oak nuances that lift the fruit and broaden the palate; and less aggressive lactones with no overt oakiness, plankyness or dill. Slow growth American white oak of the highest quality is seasoned for a minimum of 2 years. Master Coopers Made in America barrels are handcrafted in small quantities and available in Missouri, Minnesota and Pennsylvania oak. Drunk Turtle is a family owned company located just outside of Pisa in Tuscany, Italy that produces both concrete and cocciopesto eggs in large formats for the vinification and ageing of wines. Their eggs are exported throughout the different winemaking regions of the world. The Drunk Turtle team is a group of professionals from the enological, architectural and design sectors that have rediscovered and patented a purpose for a strong, barely porous and extremely low in heavy metals ancient roman building material; cocciopesto. Drunk Turtle crafts premium unique wine amphoras in different sizes from cocciopesto and concrete. Drunk Turtle is most famous for their cocciopesto eggs. Cocciopesto is a natural building material that the Ancient Romans used for aqueducts and vessels for transporting wine and water. The patented mixture is made of small fragments or “cocci” of crushed terracotta, stone, sand, de-chlorinated water and small quantities of a natural binding material. Due to the very limited amount of binding material in the mixture, cocciopesto contains very few heavy metals meaning an epoxy coating or massive tartaric acid buildup is not needed before using the vessel for fermenting or aging. The natural makeup of cocciopesto brings minerality, complexity, freshness and adds texture and mouthfeel to wine. The extremely low porosity of cocciopesto allows for very slight micro-oxidation to occur. Antica Fornace Montecchio has been producing terra cotta goods since the 1700’s and remains a family run farm, winery and business located in San Donato which is in the comune of Impruneta in the Chianti region of Italy. In collaboration with Massimmo Ricci; a famous architecture professor from Florence, Montecchio produces small, large and practical terra cotta vessels for winemaking purposes. Marco Boracchini, a technical engineer that previously ran ceramic and other terra cotta operations oversees the terra cotta side of the business. With four large ovens, years of experience, collaborating with Ricci and easy access to Impruneta’s most sought after terra cotta quarries, Montecchio takes pride in crafting standard and unique amphorae used for the fermentation and aging of wines. Pottery and the specific use of producing amphoras for winemaking purposes was brought to Tuscany during the Etruscan empire dating back to 700 B.C. The comune of Impruneta represents a unique 200 square km region in the hillsides of Florence between the Ema and Greve rivers that contain open air mines where the local terroir’s clay and rocks contain high percentages of “galestro” which provide resistance to color and temperature fluctuation. Impruneta clay is also famous for being lower in metals especially iron in comparison to other clays. The amphorae are built following two methods; either in molds or via the Colombino method which is done entirely by hand. the "colombino" technique that is pictured to the left where you can only build 30 cm per day. Or, for smaller units, the amphora can be built via molds. If managed well, can be used forever. Tonnellerie Maury & Fils is a traditional fourth generation cooperage that originated along the “quai des chartrons quartier” of Bordeaux in 1893. It is in this area of the city along the Garonne river that wine barrels were loaded onto ships and exported to Britain and soon after, around the world. Tonnellerie Maury specializes in the 225 L Bordeaux barrel but also makes sizes ranging up to 500 L puncheons based on different oak grain tightnesses originating from different French oak forests from the center of France. Mathieu’s proximity to Bordeaux has allowed the brand to position itself as a preferred partner rather than a mere provider to Bordeaux’s greatest Châteaux. Tonnellerie Maury is part of the PEFC (Programme for the Endorsement of Forest Certification), which is the world’s largest forest certification system that promotes sustainable forest management. Tonnellerie Maury barrels focus on fruit purity, expression, aromatics, and structure. Maury provides the perfect balance of power and elegance with plush tannins and a generous but tight mid palate with exceptional length. Medium toast provides a core of red fruit and a refined, even palate with fine-grained tannins. Medium Plus pushes dark fruit, violet and cocoa, while adding volume and remaining in balance. Maury barrels allow the fruit to remain in focus while providing lift and fullness. The barrels are delicate enough for a lighter vintage but have enough personality and impact to excel in warmer vintages and richer wine styles. Fruit expression, elegance, and consistent mouth feel from entry to finish. Besides barrels, Bouchard Cooperages represents Canadell for oak alternatives and Chêne-oelogie for French oak tannins. Non-oak oak related, Bouchard Cooperages works with Drunk Turtle for cocciopesto and concrete eggs, Montecchio for Impruneta terracotta amphorae and Vin et Terre for “grés” sandstone jarres. Every supplier in the Bouchard Cooperages portfolio has a unique style, reputation and specialization to cater to different segments of the wine and beverage alcohol industry. 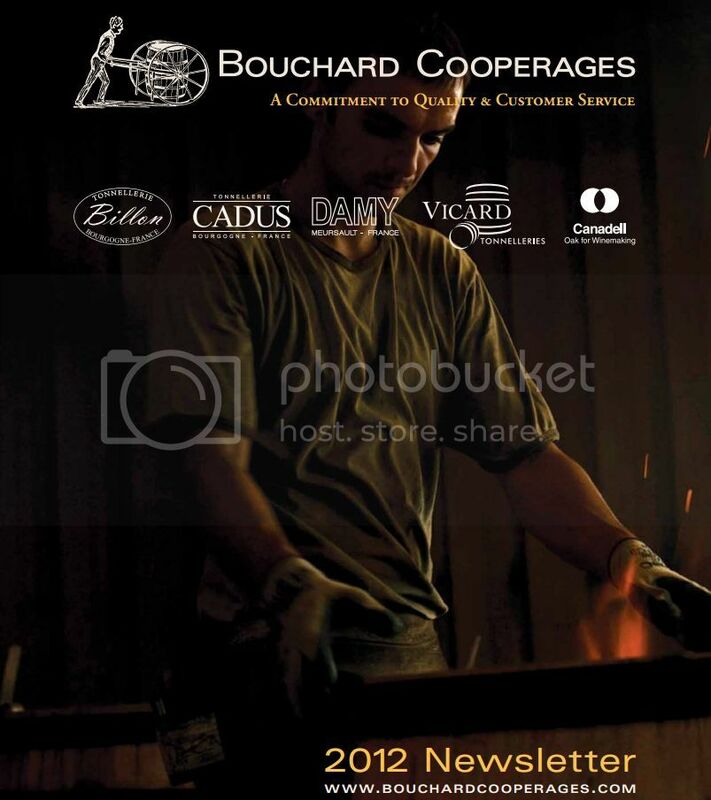 Please reach out to sales@bouchardcooperages.com for more information and their 2019 pricing and portfolio. Within the last 10 years, modern winemaking has veered away from heavy oak influence. Perhaps this is because we, as a New World wine region, are only now beginning to embrace tradition, practicing Old World winemaking techniques. Or maybe we’re finally beginning to understand our definition of terroir, producing fruit, and thus wines, suitable to climate and soil. Or perhaps it’s America’s new-found foodie culture driving this trend, as consumers begin to understand wine as an ingredient to a well-rounded meal, specifically searching for wines that complement and don’t overpower the palate. “It is the evolution of the wine consumer,” said Ron Celaya, sales representative for Demptos USA in Napa, Calif., who said, for the most part, his winemaking clients are no longer looking for the phenolic, smoky aromas that present themselves as bacon, burnt coffee and black pepper. Instead, they’re looking for what Celaya refers to as “less obvious” and “more complex” aromas, including white chocolate, potpourri and baking spice. “Those (harsher) flavors don’t lend themselves well to food pairing,” Celaya said, adding that he’s noticed the American palate has been evolving for a while: Consumers are looking for wine that complements rather than challenges what’s created in the kitchen. Elizabeth Van Emst, general manager at Cooperages 1912 Napa, had a similar observation, stating that, especially in the super-premium wine categories and direct-to-consumer programs, requests from her winemaking clients for lighter toasts have become much more prevalent. “Barrel demand is ultimately driven by the end consumer’s tastes. Balanced wines with complexity and length are what wine drinkers are demanding,” she said. Celaya has also observed that American viticulture, in general, has become more balanced. “We’re getting grapes that are fresher, more vibrant with acidity. You certainly don’t want to ruin what the viticultural team has done by using strongly toasted barrels,” he said. Paolo Bouchard, business development manager for Bouchard Cooperages in Napa, said many of his clients are now requesting even less toast impact: light-long toast, which he explains as the same process as medium long, but with the toast taking place on an even smaller fire. “We’re seeing more and more requests for light-long toasts on delicate reds or aromatic white varietals,” Bouchard said. The flavor profile and textural influence of a barrel starts in the forest. Just as terroir influences grapevines and the resulting wines, so do different forests impart specific characteristics into the trees and, thus, the barrels. Bouchard said cooperages began steering away from distinguishing forest origin in barrels and moved toward grain-tightness specification after several scandals involving cooperages that promoted forest specificity, but in fact were making forest mixes or grain-tightness mixes. “It is possible to find tight grain in most forests, although some forests contain significantly higher percentages of tight grain,” he said. Bouchard added it’s easier for boutique cooperages that have a longstanding reputation in the industry to focus more on forest origins and barrel quality. He cited Tonnellerie Billon, which produces 12,000 barrels, and Tonnellerie Damy, which makes 22,000 barrels annually, (both of which are sold by Bouchard Cooperages) among those cooperages that have continuously and reliably branded their barrels with forest-specific names. “It’s easier to work with forest-origin barrels when you are not making a gargantuan amount of barrels, just like it is easier to focus on quality when making smaller quantities,” Bouchard said. Drunk Turtle is a family owned company located just outside of Pisa in Tuscany, Italy that produces both concrete and cocciopesto fermentation and aging eggs or Opuses in small and large formats that are used throughout the world. Cocciopesto is a natural building material first used by the ancient Romans to create vessels and aqueducts for wine and water. The patented compound is made of fragments, or “cocci”, of crushed terracotta, stone, sand, de-chlorinated water, and small quantities of a natural binding agent. The mixture is then left to air dry in a mold, after which the vessels can be customized for enological applications. The material is less basic and contains significantly less heavy metals than concrete, therefore only requiring a small tartaric wash. The natural materials in Cocciopesto are extremely durable, and their contact with wine brings minerality, complexity, freshness and brightness. Cocciopesto Opuses are also very slightly porous, allowing for slight micro-oxidation. The vessels thickness and building components provides thermal inertia qualities, therefore naturally protecting the wine from temperature fluctuations. Drunk Turtle Opus are available in sizes from 3.5HL to 25HL and are most popular with light reds and whites for building texture and softness on the palate, whilst retaining acidity, tension and promoting fresh fruit characters. Master Cooper American Oak made in America barrels is a premium American Oak barrel brand incorporating Vincent Bouchard’s savoir-faire that are coopered at a premium United States Cooperage. Having being introduced on the market since 2015, the style of the barrels reflects elegance and balance. They highlight American Oak’s nuances while respecting and lifting the fruit rather than providing aggressive lactones and over the top oakiness, plankiness, dill and vanilla, which stylistically American Oak can have a reputation for. Missouri oak offers sweetness and vanillin notes while filling and broadening out the mid palette. Pennsylvania oak, slightly more tight-grained than Missouri, brings subtle spice notes that accent the barrels proprietary toast. Minnesota oak is the tightest grained of the selection and provides elegance and depth while respecting the varietal’s characteristics. All barrels are toasted using Vincent Bouchard’s proprietary toasting method that includes toasting the barrel at a very low flame for a very long time and then allowing the barrels to slowly cool down at a consistent rate that is 100% repeated from barrel to barrel to ensure consistency. This style of toasting American Oak optimizes the oak’s essence while minimizing its’ undesirable characteristics. The barrel’s heads are toasted and 225 L / 228 L Bordeaux and Burgundy Export start at $450.00 a barrel. If you are looking for Premium American Oak barrels that are not overly impactful and dominant and priced reasonably, the Bouchard Cooperages team invites you to trial some in your 2018 vintage programs. For over a year now, Bouchard Cooperages has proudly represented one of Hungary’s principal Cooperages: European Coopers. Founded in 1997, European Coopers is not Hungary’s largest cooperage, but they are very proud of the fact that they source 100% of their oak from Hungarian forests to create their barrels and use no oak from bordering Eastern European countries. Vincent Bouchard, founder of Bouchard Cooperages, along with two other Italian families is a partner in European Coopers. With 38 years of experience in the cooperage industry, Bouchard provides European Coopers with technical advice and consulting. Hungary has a long history of winemaking and coopering. During the French Napoleonic wars, France’s wine industry sourced barrels from Hungary because French oak trees at the time were reserved for building naval ships. The quality of Hungarian oak barrels made significant strides after the fall of the Berlin wall in 1989, when Hungary opened up to the common market. This resulted in drastic qualitative improvements in both Hungarian winemaking and coopering. What makes Hungarian Oak truly unique is Hungary’s mix of maritime and continental climates, unique volcanic soils, cold long winters, an abundance of Quercus Petraea oak trees and Hungary’s Forestry Services maintenance and preservation of the forests for coopering purposes. European Coopers sources all of their Hungarian oak from two regions: the Tokay Mountains in North Eastern Hungary and the Mecsek Hills in South Western Hungary. Hungary’s North Eastern Tokay region is characterized by a colder climate, higher elevation, rocky volcanic unfertile soils and significantly higher percentage of Quercus Petraea, all of which create a slow growing, tighter grained oak. When coopered, European Coopers’ Tokay oak barrels are elegant and less impactful, with perfumed aromatics that are very respectful of the fruit. The climate in Hungary’s South Western Mecsek Hills is more maritime, hotter and experiences sporadic weather patterns. The elevation is lower, the soil is more fertile and there is more Quercus Robur, all of which create a faster growing and more open grained oak. When coopered, European Coopers’ Mecsek oak barrels are slightly more structural and tend towards more nut and oat aromas. Regardless of the forest, however, European Coopers Master Cooper Kristóf Flódung prefers to source oak from the canyons and steeper sloped areas of both forests because he believes that in these areas there is greater competition between the trees. This competition makes the trees suffer and fight more to grow, resulting in a tighter grained oak that when coopered creates a more fruit respectful barrel. European Coopers produces five different forest specific barrels that vary due to their percentages of Tokay or Mecsek. The barrels do best where the winemaker seeks less impactful oak characteristics to craft wines that are true to the varietal and honor the terrior. Priced below 700 Euros, European Coopers barrels offer amazing value and are becoming more and more popular in North America and throughout the world. For more information on European Coopers, Bouchard Cooperages and barrel information, visit: Bouchard Cooperages and European Coopers. Come see Bouchard Cooperages at the WIN Expo on November 30th. Stop by our booth's #205, #304, #203, and #302 for 2 Amazing Expo Deals available only at the WIN Expo. 15% discount for any custom made Italian Montecchio Terracotta amphorae placed at WINEXPO 2017. Fattoria Montecchio has been crafting small and large format winemaking amphorae from Impruneta clay for generations. These vessels are used as fermenting and aging vessels amongst premium old and new world wineries. 15% discount for any custom made Italian Drunk Turtle Cocciopesto or Concrete amphorae placed at WINEXPO 2017. Drunk Turtle crafts concrete and cocciopesto (ancient Roman concrete) tanks. Cocciopesto is made of fragments of rocks, clay, sand, and terracotta and brought together with small quantities of a binding agent. These tanks allow for natural temperature stabilization, micro-oxidation, added texture on the palette and brightness in the wines. These vessels can be used for fermenting and aging and have been adopted by top wineries around the world. Bouchard Cooperages is lucky to represent Tonnellerie Billon and Tonnellerie Damy, both located in Burgundy, who since their creation have stayed true to the forest and still make single forest barrels solely from the most recognized in France - Jupilles, Allier, Tronçais, Nevers, Bertranges, Cîteaux, Vosges and Jura. France has over 16.15 million hectares of oak forests and similar to France's varied climate, certain forests have typicities that are true to that specific forest. Similar to how great vineyards have great terroirs, good oak forests for coopering have different soil types, microclimates, forest densities and weather patterns making that forest unique. When it comes to France and it’s famous oak forests, the nation can thank Louis XIV. King Louis helped establish strict policies that helped conserve and replenish France’s oak forests for future generations even while the nation’s navy was at war with the rest of Europe. France’s reputation as the best winemaking nation on the planet created a symbiotic relationship with the quality of its’ oak forests used for coopering that soon became recognized internationally. Since it’s inception in 1966, l’Office National des Fôrets known as the ONF has ensured that France's oak forests are restored, surveyed, protected and managed adequately. Because the ONF manages France’s more premium oak forests, 80% of all premium French oak destined for winemaking is purchased directly from the ONF. Europe is rich in oak forests that span from Spain throughout France, to the tip of Germany and then back down towards Hungary in a “croissant” like shape. Drunk Turtle is a family owned company located just outside of Pisa in Tuscany, Italy that produces both concrete and Cocciopesto amphorae in large formats for the vinification and ageing of wines. Their amphorae are exported throughout different winemaking regions in the world and can now be found in North America through Bouchard Cooperages. Drunk Turtle produces both concrete and Cocciopesto tanks, but they are most recognized for the latter. Cocciopesto is a natural building material first used by the ancient Romans to create vessels and aqueducts for wine and water. The patented compound is made of fragments or “cocci” of crushed terracotta and stone, sand, de-chlorinated water, and small quantities of a natural binding agent. The mixture is then left to air dry in a mold for three weeks, after which the amphorae can be customized for enological applications. Because the quantity of binding agent used is so small, the levels of heavy metals are extremely low—so low in fact that Cocciopesto amphorae have received alimentary certification from the prestigious TÛV laboratory in Germany, meaning an epoxy coating is not needed inside the amphorae. The natural materials in Cocciopesto are extremely durable, and their contact with wine brings minerality, complexity, freshness and brightness to the wine. Cocciopesto amphorae are also porous, allowing for micro-oxidation; and their thickness provides thermal inertia, protecting the wine from temperature fluctuations. We encourage you to try these natural amphorae that have been used by our ancient ancestors for centuries. European Coopers is one of Hungary's three principal cooperages and is proud of European Coopersremaining independent since its establishment two decades ago. With over forty years of experience, Master Cooper Kristof Floding has been at the heart of European Coopers since day one in 1997. Kristof and his team control the entire process in house, from sourcing and selecting the logs, seasoning the staves, to producing and finishing the barrels. European Coopers has first rights for sourcing tight grained Quercus Patraea logs from Hungary’s best forests: the Tokaj Mountains and Mecsek Hills located next to the Tokaj and Villány wine regions. European Coopers is committed to using 100% premium Hungarian oak—no additional oak is sourced from neighboring Easter European countries. The staves are air dried for 36 months, fire bent and toasted over oak fires from the same oak. Stylistically the barrels lift and showcase the fruit, and soften and add length to the palate. In terms of power, they are slightly lower in impact than their French cousins. The barrels bring characters ranging from fresh bread, oats, and brown sugar through to roasted nuts, honey and caramel, depending on toasting levels. The most common answer is that oak adds complexity. Oak barrels can offer a simple wine greater depth and dimension, and elevate a great wine to a higher level. The sensory influence of wood on wine is primarily due to oak lactones, vanillin, and a collection of volatile phenols. The oak barrel contributes to wine quality in several ways, beyond its long-time use as storage and transport vessel. Most important is its role as flavor enhancer, which is what makes the subject of forest origin (and their different flavor contributions) so interesting to winemakers. Oak is the common name for over 300 species of trees belonging to the genus Quercus. Oaks are widely distributed, and prolific, throughout the temperate regions of the Northern Hemisphere and at high elevations in some parts of the tropics. Of the many species, only a few are suitable for cooperage for the simple reason that they must be non-porous (i.e. not leak). The most common oaks of Europe are Quercus petraea (also known as Q. sessilis) and Quercus robur (Q. pendunculata). In the United States, the predominant species is Q. alba, while Q. gerryanna (commonly referred to as Oregon oak) plays a small but increasingly important role. Until about 25 years ago, oak was oak and little consideration was given to its origin. Today, a great deal of importance is placed on oak origin, not only origin by country but by specific, often quite small, areas within a country. This particularly applies to oak from France, possibly because it is only in this country that the regions of origin have been carefully defined. There is interest and great strides that have been made towards identifying the most significant regions for cooperage quality oak in the United States. So, just how Important is Oak Origin? Just as terroir is important in premium wine grapes, it is equally important in fine oak barrels. There is no doubt that the origin of oak has a unique effect on wine matured in a barrel made from its wood, but is it THE most important factor, AN important factor, or a MINOR factor? Here is where the debate begins . . . Most coopers and winemakers will agree that the most significant factor is the manner in which the cooper handles his oak. The cooper's "thumbprint" -- how the cooper seasons and stores the oak so it dries adequately, and how the barrel is fired -- sticks out above all other factors. This thumbprint or "house style" characterizes each barrel, regardless of other variables, including forest origin. Yet there exists no consensus as to what is the next most important factor . . . is it forest origin, is it tightness of grain (regardless of forest origin), is it the amount of air-dry time, or is it yet another factor. This does not even touch on the influence of the winemaker and how he treats the barrel and the wine he puts into it. No two winemakers handle their barrels or wines the same way. While oak may become available from exotic sources from time to time and in small quantities, availability of commercial quantities on a regular and continuing basis is most important. If not readily available, oak from a specific region cannot be reliably used. There are many competitive uses for high quality oak, such as veneer and furniture. Oak for cooperage purposes is more expensive to mill, and it requires specialized processing skills and proper cutting. Changing political realities also affect ongoing oak supply, as evidenced by the changes in Eastern Europe in the 1980s. These factors strongly influence which forest origins the cooper chooses to promote, and the resulting choices for the winemaker. Barrels made from American white oak were originally produced for the bourbon industry. However, American oak barrels are increasingly being used by wineries, particularly given recent improvements in barrel fabrication and of course simple economics (top quality American oak barrels typically cost about half as much as their French counterparts). American oak barrels have improved dramatically over the last ten years. In the past, only varieties with intense flavors such as Cabernet Sauvignon and Zinfandel were able to stand up to the more aggressive aromas and flavors that the American oak available at the time contributed. The reason for these dominant flavors was partly due to how the oak was coopered and seasoned. Barrel makers have implemented changes based on their observations of French oak coopering techniques, involving longer air-dry time for the staves and toasting the barrels longer with more penetrating heat. These changes have transformed the character of American oak, rendering sweeter, subtler flavors and less dominant coconut and herbaceous notes. white oak forests of the eastern U.S. exist in four "eco-regions" or climatic zones, of which the "Eastern deciduous forest region" is the most vast (see map). Preliminary results from this study indicate definite sensory differences, which are now being explored on a larger scale. A few coopers are currently offering Q. alba barrels from oaks grown in specific areas of the eastern U.S. and the Great Lakes area, while other coopers prefer to focus on grain tightness as the most important factor in determining flavor contributions. The theory is that regional designations for American oak would give winemakers more choices and greater control in matching barrels with certain regional characteristics to their winemaking style. The Technical Reason why American Oak seems more "Oaky"
When comparing oaks from France and the USA, tests indicate that French oak gives about 2 1/2 times the extraction of total phenolics, but American oak adds more flavor and perfume on a comparative basis. However, the reason why American oak gives more oakiness in the wine per unit of extract is apparently due to the higher non-tannin phenolic fraction, which is approximately 21% as compared with 14% for French oak. In France, the predominant species used by coopers are Quercus petraea (also known as Q. sessilis) and Quercus robur (Q. pendunculata). Oak in France tends to grow on its own, although it does occasionally mix with small quantities of beech and other trees. Oak hybridizes naturally, and at last count there are at least 400 hybrids. Because of this, there is uncertainty among botanists as to oak identification in France. For this reason, oak from France is carefully identified by its region of origin, even though the specie may be the same. Most of the forests of France (approximately 80%) are owned by the French government, and are managed by the Office National de Forêts, established by Napoleon II. All trees are sold by auction, prior to being cut. Oak trees for cooperage purposes are harvested when they are between 110-150 years old. Limousin (li-moo-sahn) oak comes from the old French province of that name in the southwest of France, and is predominantly Q. pendunculata. The toughness and coarse (open) grain of the wood is a result of poor growing conditions, which tend to restrict vertical growth in favor of a shorter, larger diameter tree trunk. In France, Limousin is used almost exclusively for the maturation of Cognac. Nevers (ne-vere) oak comes from the many forests of the Nievre Département in the center of France. The region is gently rolling and the soils are rich and moist. This oak is predominantly Q. sessilis. The trees grow tall and straight in forest conditions, which produces logs that are generally medium-tight grained. Allier (ah-leay) oak comes from the Département of the same name immediately to the south of Nievre. The oak is fairly similar to that of Nevers, although usually more tight-grained in structure. Tronçais (tron-say) oak differs in that it comes from a specific forest within the Allier Département. It is the best known of a number of forests deliberately planted for the ship building trade in the late 17th century. The forest is spectacular, growing in deep, fertile soils producing trees of great size with a very fine grain. The Tronçais forest is not large, and its limited production is in great demand by winemakers. Bourgogne (boar-go-nya) oak comes mainly from the forests of Cîteaux, to the east of Nuits Saint Georges in the Département of Côte d'Or. Its characteristics resemble Limousin oak, but is medium-grained. Vosges (voej) oak comes from the low mountain region in the northeast corner of France. The trees are tall with narrow trunks and the timber is medium-tight grained. This oak, which only became commercially available in the late 1970's, is increasingly in demand. Oak from the Baltic states, Serbia and particularly Hungary was very highly prized by barrel makers in the nineteenth and early twentieth centuries. The oak species throughout a crescent-shaped area, ranging from northern Portugal up through France to the Baltic states and down through Hungary and Romania, belong to the Quercus petraea and Quercus robur families. Yet a good deal of diversity in flavor and structure is evident depending on the precise microclimate, soil structure and density in which the trees grow. Traditionally, the oak of the Hungarian forests of the northeast was highly sought after by French coopers. The taste of French oak, now considered integral to the flavor of red Bordeaux, was not appreciated in Bordeaux's traditional market in the early and mid-nineteenth century. Winemakers preferred the softer, smoother texture Hungarian oak offered their wines, perhaps because less charring of the barrels was practiced. The substitution of French oak for Baltic and Hungarian oak was prompted by political difficulties, including the Napoleonic wars. A ready supply of Hungarian oak was once again available in the period spanning the late nineteenth century up to World War II, only to be cut off by changing political realities. It is only in the last twenty years that trade has been reestablished with French coopers. In the Czech Republic, barrel production was primarily for the beer industry. The wine region of southern Moravia did require some cooperage for wine, but until recently, barrels were viewed only as storage vessels. Oak flavor in wine was considered undesirable. The development of export markets has encouraged more wine barrel production, and in depth studies of Bohemian and Moravian oak are now underway. In Russia, the southern region of Adyghe, near the Black Sea, has been identified as having a large source of Q. sessilis. The less expensive cost of wood from this area has stimulated much interest. The following flavor characteristics can at best be considered generalizations, and are the personal observations of the editor, Roberta Manell Montero. Limousin (li-moo-sahn) perfumes and colors the wine (yellow-gold) rapidly with little finesse. Limousin tends to be fairly aggressive and "simple" on the palate, but adds an attractive vanillin note. Nevers (ne-vere) contributes a spicy, almost cinnamon-like flavor, although it can initially seem aggressive in tannin if not toasted enough. Vosges (voej) offers a sweet, subtle vanillin aroma that complements a fruity character. Above all, it offers a softer texture on the palate. Allier (ah-leay) releases its perfume slowly with finesse, and seems to have a spicier oak component. It is well suited to red and white wines. Tronçais (tron-say) located in Allier, releases its perfumes even more slowly, and offers a high level of finesse on the palate. It is typically the tightest grained French oak, which explains its slower rate of extraction. Hungarian oak offers very similar flavors to French oak, but its most attractive characteristic is a soft, creamy mouth texture (especially early in the wine's development). Czech oak has a sweet, nutty flavor with moderate but complex tannins. Most interesting is a floral note, which has been described as similar to mimosa, a sweet flowering tree from southern France. Russian oak imparts a more intense flavor than French oak, but with a similar flavor profile, and is perhaps not as sweet on the palate. American white oak is more aromatic and obvious in its wood character. Sensory descriptors range from dill and coconut to smoky and sweet vanilla. Q. Alba does offer more weight and intensity on the palate, but its overt character sometimes clashes with more delicate wines. Oregon oak is quite different from American oak, and descriptors commonly used include toasty, resinous, caramel, coffee, spicy and herbal. It is slightly more phenolic than French oak. Use these 5 easy steps to repair end grain leaks on your wine barrels. Visit us for more barrel repair tips. 1. Wedges are best used to fix these kinds of leaks, which can occur in either head or side staves. The first step is to use a scrapper to uncover the source of the leak (important if wine is obscuring the surface). 2. Next, and most important, determine the direction of the grain. This is a side view of a stave where the grain is at an angle. The two lines on either side represent entry and exit of the grain leak. "X" marks the spot where the grain leak surfaces. The black line on the face of the stave indicates where the wedge must be placed to stop this leak. Angle of grain ascent determines this. 3. Then use a sharp-bladed chisel to make a hole BEFORE the grain exits. The wood chisel needs to cut ACROSS the grain where the wine is seeping, never lengthwise (this would aggravate the problem). 4. Cut the wedge width to the proper size and insert it into the hole you have made. Gently tap it into position; the wedge should fit snuggly. 5. Use the wood chisel to cut off the excess wedge portion, with the backside of the blade up to make a nice cut. Please note that if the blade of the chisel is dull, you will simply pull out the wedge instead of making a clean cut. Done! Use these 4 easy steps to repair end grain leaks on your wine barrels. Visit us for more barrel repair tips. 1. End grain leaks, usually in the croze, can be plugged with a spile. 2. The first step is to use a hammer and a "scratch awl" (spile-shaped punch) to make a hole where you see the leak, to accommodate the spile. 3. Next, you snip off the end of the spile if it is too pointy (need it blunt) and insert it into the hole. Use a hammer to tap the spile into the hole you have made. It should fit snuggly, but don't over do it. 4. Then use a wood chisel to cut off the excess spile material. The blade of the chisel should be face up to make a clean cut. If necessary, smooth the exposed spile ends with sand paper to make a nice, clean finish. Done! Harvest is here, which means it's time to get those barrels ready! The following steps will allow you to minimize use of labor, water and time. This traditional method will prepare your oak barrels for use after only 24 hours! Fill the barrel with five gallons of very hot water (180ºF). Tightly insert a bung in the barrel, then rotate the barrel from side to side, and allow the water to cool. If there are no leaks present and there is a vacuum when the bung is removed, the barrel is liquid tight. If a vacuum is not present, go to step #3. Fill the barrel with five gallons of warm water (80ºF to 120ºF). Turn the barrel on its side, roll it in order to completely wet the inside surface of the barrel, then stand it on the other head. After five to six hours, turn the barrel again, so that it is once more standing upright. The next day, check to see if the barrel is free of leaks. If some leakage is apparent, repeat steps 4 – 6. If there are no apparent leaks, proceed to fill the barrel with juice or wine. If the unused wine barrels are to be stored for an indefinite period of time, keep the plastic film on the barrels to prevent them from getting dried out. When you are ready to use the barrels follow the above steps. If the soaking period is longer than a couple of days, you can always add SO2 and citric acid to keep the water fresh. In an ever-changing and increasingly specialized winemaking world, we feel it is critical to encourage innovation – but only that which remains respectful of the honored tradition that defines our age-old craft. To put it simply, we are forever committed to helping our Coopers craft a better barrel, and to helping our winemaking partners craft a better wine. As you read through this year’s Newsletter, you’ll find some innovations from our family of Coopers that respect tradition while offering unique benefits to your winemaking program. Specifically, two new barrel choices from Tonnellerie Damy: Estrella 45* and Exclusive. We encourage you to examine our entire portfolio of oak products in order to enhance the unique character of each of the wines you craft. We are pleased to announce that once again for 2015, you can combine barrel orders from all of the Coopers in our portfolio to receive volume price discounts. After 35 years of passion and dedication to the cooperage business, Vincent Bouchard is finally putting his signature on a barrel. Bouchard Cooperages is very proud to announce the introduction of Master Coopers, a new global brand that draws on decades of experience in research and development from one of the leading experts in the world on barrel fabrication and application. The essence of the brand: Vincent Bouchard has developed a unique toasting recipe for each traditional region of barrel production. He will work together with highly selected master coopers in specific winemaking regions — top coopers who know their local customers, regional grape varietals and the style of barrels most desired for them — to craft a barrel that he believes will be an essential fit as a production component for the wines produced in those regions. The first phase of the brand's introduction begins with Master Coopers Produit de Bourgogne. Working closely with a select Burgundian Cooper with whom he has had the longest relationship, Bouchard has created a barrel that shows ultimate respect for terroir. In his words, "When a barrel is at its best, the fruit is the star of the show. Over the last 35 years, I have tasted through many varietals of wines from all over the world in thousands of barrels from all different Coopers. After a while, you begin to realize that each Cooper has a distinct signature. Some are quite overpowering, while others are almost invisible. Some add their impact on the nose, some in the mid palate, and others on the finish." "What I wanted to achieve with the Master Coopers recipe is a complete integration of wood and wine throughout five stages of tasting: the nose, the front palate, the mid palate, the finish, and what in Italy we call the "retro gusto," where the wine comes back after spitting. The integration will be balanced in a way that shows a reverence for fruit and terroir. The barrel will play an important role, much like a full orchestra in front of the stage; but the spotlight will be on the stage itself, where fruit and terroir play the leading roles." As a team, Bouchard Cooperages collaborates with Winemakers on specific grape varietals, terroirs, and winemaking styles to provide barrels that create a balanced integration throughout the five stages of tasting, often helping the Winemaker ameliorate what might be lacking in any of the five stages — fruit on the nose and front palate, roundness and support in the mid palate, substantial length, and retro gusto. Master Coopers Produit de Bourgogne barrels will feature 100% 3-year air-dry French oak from specially selected premier forests, and will be available in both the "Slow Blue" and "Slow Red" toasts: Slow Blue for Chardonnay and other whites; Slow Red for Pinot Noir and other delicate/aromatic reds. Since 1979, Bouchard Cooperages has been steadfastly committed to providing Winemakers around the world with access to the finest quality, customfabricated French oak barrels at an affordable price. Today, we also offer American and Eastern European oak barrels, as well as a complete line of the highest quality French oak alternatives. We take great pride in building long-term relationships with our Winemakers; because we believe that it is only through these evolving collaborations that we can best assist you in your passion to create great wines. Our International Barrel Consultants are always happy to visit with you, and if possible taste through your wines in order to help you find the best match for your particular varietal(s), terroir(s), and winemaking style. They travel the world and taste through thousands of barrels—we encourage you to utilize their ever-increasing knowledge to your benefit in your endeavors. Each spring we host a series of Winemaker Tasting Events in various wine regions throughout North America. At these increasingly popular events, we invite our Winemakers to taste great wines that feature our barrels and alternatives as we share the latest news in our collective passion. Our primary goal is to work with our Winemakers to help you develop and refine an oak recipe that is uniquely tailored to your individually crafted wines. Once the recipe is developed, we then work diligently with our family of Coopers in an on-going effort to achieve the highest levels of quality and consistency. Remember, it is often said that consumers will buy the first bottle of your wine based on the label, but the second bottle on flavor. We encourage you to examine our entire portfolio of oak products in order to enhance the unique character of each of the wines you craft. For over 32 years, Bouchard Cooperages has been steadfastly committed to providing Winemakers around the world with access to the finest quality, custom-fabricated French oak barrels at an affordable price. Today, we also offer American and Eastern European oak barrels; and this year we are proud to announce the addition of Canadell French oak alternatives to our portfolio (see pg. 8). We take great pride in nurturing long-term relationships with our Winemakers. We firmly believe that it is only through these evolving collaborations that we can best assist you in your passion to create great wines. Our team of International Barrel Consultants is always happy to visit with you, taste through your wines, and help you find the best match for your particular varietal(s), terroir(s), and winemaking style. They travel the world and taste through thousands of barrels—we encourage you to utilize their ever-increasing knowledge to your benefit in your endeavors. Each spring we host a series of Winemaker Luncheons/Tasting Events in various wine regions throughout North America. At these increasingly popular events, we invite our Winemakers to taste great wines that feature our barrels as we share the latest news in our collective passion. Our primary goal is to work with our Winemakers to help you develop and refine an oak recipe that is uniquely tailored to your individually crafted wines. Once the recipe is developed, we then work diligently with our family of Coopers in an on-going effort to achieve the highest levels of quality and consistency. Remember, it is often said that consumers will buy the first bottle of your wine based on the label, but the second bottle on the flavor. We encourage you to examine our entire portfolio of oak products in order to enhance the unique character of each of the wines you craft. In an ever-changing and increasingly specialized winemaking world, we feel it is critical to encourage innovation—but only that which remains respectful of the honored tradition that defines this age-old craft. To put it simply, we are forever committed to helping our Coopers build a better barrel, and to helping our Winemakers craft a better wine. As you peruse this year’s Newsletter, you’ll find new and innovative products from our Coopers that respect tradition while offering unique benefits to your winemaking program. CLICK HERE for complete newsletter. Canadell is a 4th-generation company with facilities in Trie-Sur-Baïse and Ully-Saint-Georges that has been supplying high-quality staves to the largest cooperages in the world for over 60 years. They are the oldest and remain the premier customer of the L'Office National des Forêts (ONF). Using only 100% French oak duramen (no bark or sapwood) from the finest high timber forests, Canadell applies strict proprietary toasting regimens to craft a complete line of oak alternatives – from oak powder to oak chips, dominoes and tank staves/fans. In 2012, we are proud to announce the addition of the Canadell line of oak alternatives to the Bouchard Cooperages portfolio, and we look forward to a long and prosperous relationship together. Please contact Sarah Lanzen, our International Oak Alternatives Consultant, for more information at 707-592-9961. Current pricing information is available at www.bouchardcooperages.com or by calling us directly at (707) 257-3582.